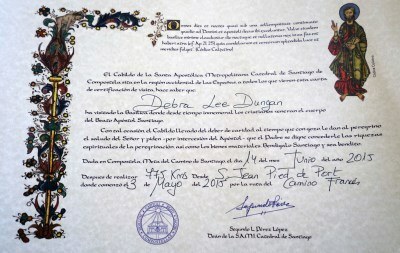 Much like getting a diploma when you graduate school, once you reach the Cathedral in Santiago de Compostela, you can get your Compostela. Of course, there are no classes or tests to take, but you do still need to meet some minimum requirements. First, if you are walking on the Camino Francés, you need to have walked the last 100 kilometers/60 miles (staring in Sarria), or if traveling by bicycle or horseback, the last 200 kilometers/120 miles. You also need to obtain a minimum of two sellos per day in your Credencial starting in Sarria. And you need to preferably make the journey for religious or spiritual reasons. 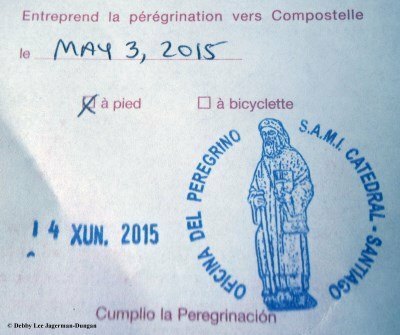 Once in Santiago de Compostela, you take your Credencial filled with sellos to the Oficina del Peregrino to get your Compostela. Let me explain these terms in more detail. Peregrino: A pilgrim. A person who makes a journey to a sacred place for religious reasons. One who walks any of the numerous routes of the Camino de Santiago. Sellos: Ink rubber stamps. 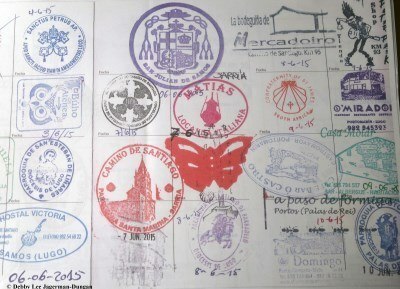 As a peregrino walks along, you get these stamps mostly in places of accommodation, such as albergues, as well as in churches and cathedrals, and various food establishments. Each place has a unique sello, and it is fun to see the all the colors and designs of the sellos. Albergue: A place of accommodation similar to a hostel. 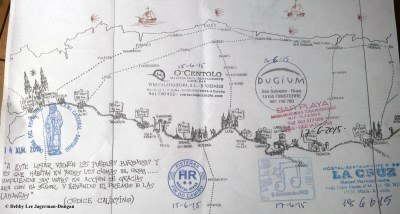 Credencial del Peregrino: Pilgrim’s Passport. This is kind of like a passport when you travel, as it is the booklet used to collect the colorful sellos. 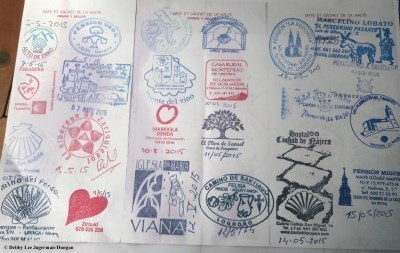 You can buy these either before you leave for your Camino online, or get them at some churches, main albergues, and tourist offices at the start of your Camino. The Credencials are also to be shown at accommodations. 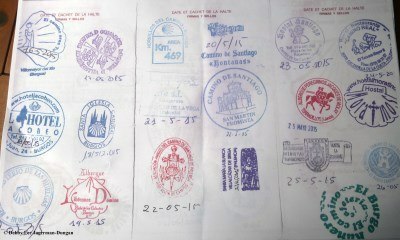 If a peregrino travels a lot of miles and obtains a lot of sellos, they may fill up more than one Credencial, as I did. Sarria: This is the town that is about 100 kilometers from Santiago de Compostela, the minimum requirement, and thus it is a popular place to start the Camino Francés. Oficina del Peregrino: Pilgrim’s Office. 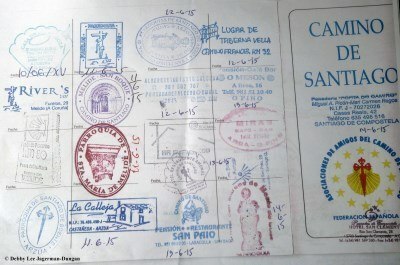 This is the place in Santiago de Compostela where a peregrino shows their Credencial filled with sellos to prove their journey, and obtains a Compostela. 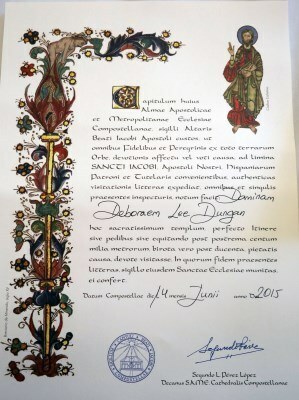 Compostela: This is like a diploma. It is the official certificate of completion and accomplishment! 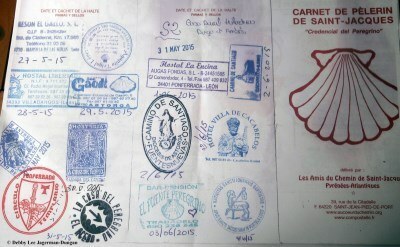 The Catholic Church issues these to honor the peregrinos who have made the journey on the Camino de Santiago, whether 100 kilometers, 775 kilometers, or more. Your name will be printed on the Compostela in Latin. My Latin name apparently is Deboraem. You can actually get a second Compostela that says how many kilometers you walked and the town you started. 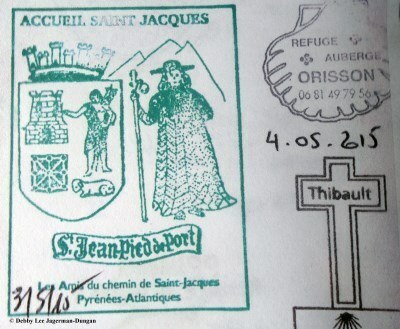 For me, 775 kilometers from St. Jean Pied de Port! I also believe that if you don’t walk for religious or spiritual reasons, there is a Compostela for non-religious reasons. 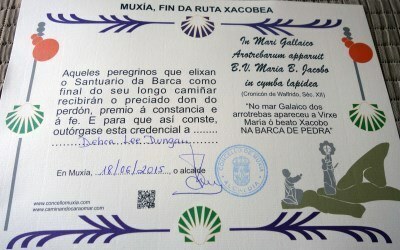 I also received a Compostela for walking the 20-mile/32-kilometer Camino Finisterre to Muxía. 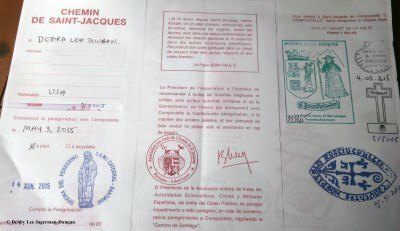 Now, did you get all this information straight about the sellos, Credencials, and Compostelas on the Camino de Santiago? Because if you get your pencils out please, there will be a test. Translation of Compostela is from the book “To the Field of Stars: A Pilgrim’s Journey to Santiago de Compostela” by Kevin A. Codd.